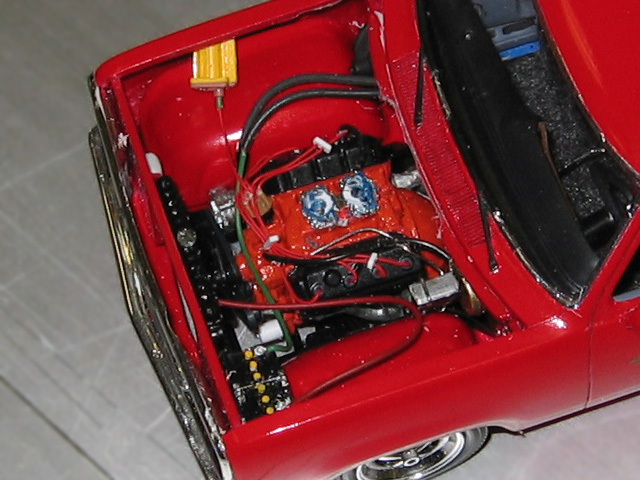 Zoli transplanted a 426 Hemi, complete with dual 4-bbl Carter AFB's and a massive shaker scoop, out of an AMT/ERTL Hemi 'Cuda kit. While he was at it, he added some aftermarket parts such as the bright yellow Accel Super Coil atop the right fender well. He also complemented the engine bay with plug wires, fuel lines, and heater hoses.